(AP) MIAMI - The U.S. is locking up more illegal immigrants than ever, generating lucrative profits for the nation's largest prison companies, and an Associated Press review shows the businesses have spent tens of millions of dollars lobbying lawmakers and contributing to campaigns. The cost to American taxpayers is on track to top $2 billion for this year, and the companies are expecting their biggest cut of that yet in the next few years with government plans for new facilities to house the 400,000 immigrants detained annually. After a decade of expansion, the sprawling private system is largely controlled by just three companies. The growth is far from over, despite the dramatic drop in illegal immigration in recent years. In 2011, nearly half the beds in the nation's civil detention system were in private facilities with little federal oversight, up from just 10 percent a decade ago. The detention centers are located in cities and remote areas alike, often in low-slung buildings surrounded by chain-link fences and razor wire. U.S. Immigrations and Customs Enforcement agents detain men, women and children suspected of violating civil immigration laws at these facilities. Most of those held at the 250 sites nationwide are illegal immigrants awaiting deportation, but some green card holders, asylum seekers and others are also there. The companies also have raked in cash from subsidiaries that provide health care and transportation. And they are holding more immigrants convicted of federal crimes. The financial boom, which has helped save some of these companies from the brink of bankruptcy, has occurred even though federal officials acknowledge privatization isn't necessarily cheaper. This seismic shift toward a privatized system happened quietly. While Congress' unsuccessful efforts to overhaul immigration laws drew headlines and sparked massive demonstrations, lawmakers' negotiations to boost detention dollars received far less attention. The industry's giants - Corrections Corporation of America, The GEO Group, and Management and Training Corp. - have spent at least $45 million combined on campaign donations and lobbyists at the state and federal level in the last decade, the AP found. CCA and GEO, who manage most private detention centers, insist they aren't trying to influence immigration policy to make more money, and their lobbying and campaign donations have been legal. "As a matter of long-standing corporate policy, CCA does not lobby on issues that would determine the basis for an individual's detention or incarceration," CCA spokesman Steve Owen said in an email to the AP. The company has a website dedicated to debunking such allegations. GEO, which was part of The Wackenhut Corp. security firm until 2003, and Management and Training Corp. declined repeated interview requests. Advocates for immigrants are skeptical of claims that the lobbying is not meant to influence policy. "That's a lot of money to listen quietly," said Peter Cervantes-Gautschi, who has helped lead a campaign to encourage large banks and mutual funds to divest from the prison companies. The total average nightly cost to taxpayers to detain an illegal immigrant, including health care and guards' salaries, is about $166, ICE confirmed only after the AP calculated that figure and presented it to the agency. That's up from $80 in 2004. ICE said the $80 didn't include all of the same costs but declined to provide details. 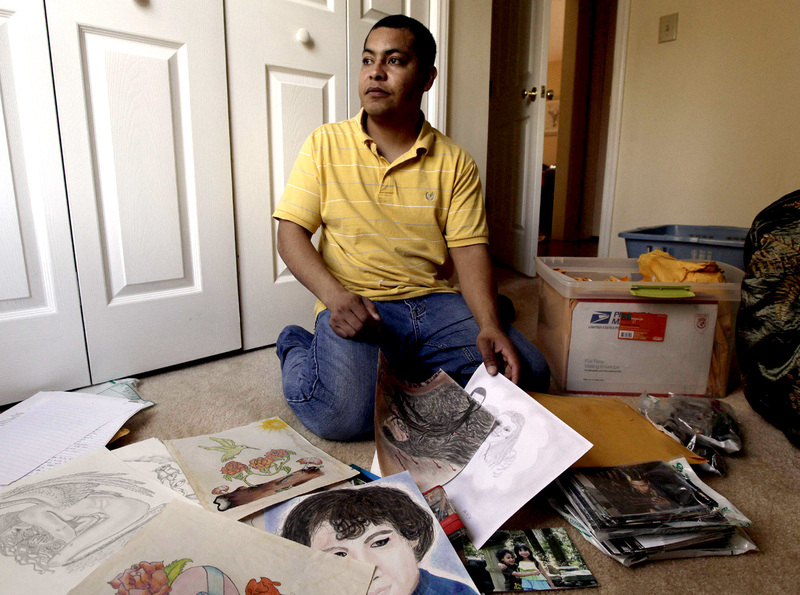 Pedro Guzman is among those who have passed through the private detention centers. He was brought to the U.S. by his Guatemalan mother at age 8. He was working and living here legally under temporary protected status but was detained after missing an appearance for an asylum application his mother had filed for him. Officials ordered him deported. Although he was married to a U.S. citizen, ICE considered him a flight risk and locked him up in 2009: first at a private detention facility run by CCA in Georgia and eventually at CCA's Stewart Detention Center, south of Atlanta. Guzman spent 19 months in Stewart until he was finally granted legal permanent residency. "It's a millionaire's business, and they are living off profits from each one of the people who go through there every single night," said Guzman. "It's our money that we earn as taxpayers every day that goes to finance this." The federal government stepped up detentions of illegal immigrants in the 1990s as the number of people crossing the border soared. In 1996, Congress passed a law requiring many more illegal immigrants be locked up. But it wasn't until 2005 - as the corrections companies' lobbying efforts reached their zenith - that ICE got a major boost. Between 2005 and 2007, the agency's budget jumped from $3.5 billion to $4.7 billion, adding more than $5 million for custody operations. Dora Schriro, who in 2009 reviewed the nation's detention system at the request of Homeland Security Secretary Janet Napolitano, said nearly every aspect had been outsourced. "ICE was always relying on others for responsibilities that are fundamentally those of the government," said Schriro, now the New York City Correction Commissioner. "If you don't have the competency to know what is a fair price to ask and negotiate the most favorable rates for the best service, then the likelihood that you are going to overspend is greater." Private companies argue they can save Americans money by running the centers more cheaply. Pablo Paez, a spokesman for the Florida-based GEO, said in an email his company supports public-private partnerships which "have been demonstrated to achieve significant cost savings for the taxpayers." He declined to answer specific questions. But ICE Executive Associate Director for Enforcement and Removal Operations Gary Mead said the government has never studied whether privatizing immigrant detention saves money. "They are not our most expensive, they are not our cheapest" facilities, he said. "At some point, cost cannot be the only factor." One fundamental difference between private detention facilities and their publicly run counterparts is transparency. The private ones don't have to follow the same public records and access requirements. President Barack Obama has asked for less detention money this year and encouraged the agency to look at alternatives to locking people up. He also ordered DHS to stop deporting young immigrants brought to the U.S. illegally, which could reduce the number behind bars. Congress, however, can approve more detention spending than DHS requests. Beyond civil detention centers, private companies are also making more money locking up non-citizens who commit federal crimes. To deter illegal border crossers, federal prosecutors are increasingly charging immigrants with felonies for repeatedly entering the country without papers. That has led thousands of people convicted of illegal re-entry, as well as more serious federal offenses, to serve time in private prisons built just for them. A decade ago, more than 3,300 criminal immigrants were sent to private prisons under two 10-year contracts the Federal Bureau of Prisons signed with CCA worth $760 million. Now, the agency is paying the private companies $5.1 billion to hold more than 23,000 criminal immigrants through 13 contracts of varying lengths. CCA was on the verge of bankruptcy in 2000 due to lawsuits, management problems and dwindling contracts. Last year, the company reaped $162 million in net income. Federal contracts made up 43 percent of its total revenues, in part thanks to rising immigrant detention. GEO, which cites the immigration agency as its largest client, saw its net income jump from $16.9 million to $78.6 million since 2000. "Another factor driving growth ... for the private sector is in the area of immigration and illegal immigration specifically," Chief Financial Officer Brian Evans told investors in GEO's 2011 3rd quarter earnings call. CCA warned in its 2011 annual earnings report that federal policy changes in "illegal immigration could affect the number of persons arrested, convicted, and sentenced, thereby potentially reducing demand for correctional facilities to house them." Utah-based Management and Training is not publicly held, so it does not post earnings. At just the federal level, these companies, their political action committees and their employees have spent more than $32 million on lobbying and on campaign contributions since 2000 - with the national political parties getting the largest campaign contributions. An AP review of Federal Election Commission data found the prison companies and their employees gave to key congressional leaders who control how much money goes to run the nation's detention centers and who influence how many contracts go to the private sector. James Thurber, head of American University's Center for Congressional & Presidential Studies, said amid the heated national debate over immigration, the companies have been savvy not to donate heavily to those sponsoring legislation, which could spark backlash. There are more discreet and more powerful ways to influence policy, Thurber said. "Follow the money," he said. "If the money is being increased significantly for illegal immigration, then that is a shift in policy ... a significant shift." - The Republican Party. Its national and congressional committees received around $450,000. Democrats received less than half that. - Arizona Republican Sen. John McCain. He received $71,000, mostly during his failed presidential bid against Obama, well after he dropped support for a bill that would have given illegal immigrants a path to citizenship and reduced detentions. - House Speaker John Boehner received $63,000. -Kentucky U.S. Rep. Hal Rogers received about $59,000. Rogers chaired the first subcommittee on Homeland Security and heads the powerful House Appropriations Committee. He often criticizes ICE for not filling more detention beds. - Former U.S. Senate Majority Leader Bill Frist. He received $58,500. The lawmaker from Tennessee, where CCA is headquartered, led the Senate at the height of the nation's immigrant detention buildup from 2003 to 2007. More than campaign contributions, though, the private prison companies spent most of their money each year on lobbying in Washington, peaking in 2005 when they spent $5 million. In just 2011, CCA paid the Washington firm Akin Gump Strauss Hauer & Feld $280,000 in part to "monitor immigration reform," federal reports show. They also lobbied heavily against a bill that would force them to comply with the same open records requirements governing public facilities. Owen, the CCA spokesman, said the company increased lobbying to acquaint new lawmakers with the industry. "In recent years, federal elections have been very volatile, resulting in a lot of new faces in Washington," he said. "The result of that volatility means a lot of people at the federal level who may not be familiar with the work we do." The prison companies' influence at the state level mirrors that in Washington, although the money is even harder to track since many states, such as Arizona and Illinois, where the companies have won lucrative detention contracts, don't require corporations to disclose what they pay lobbyists. The AP reviewed campaign contribution data from the three companies' political action committees and their employees over the last decade, compiled by the National Institute on Money in State Politics. From 2003 to the first half of 2012, state candidates and political parties in the 50 states received more than $5.32 million. In the 10 states where the companies' committees and employees contributed the most, the AP found they also spent at least $8 million more lobbying local officials in the last five years alone. It is impossible to know how much of this lobbying money was aimed only at immigrant-related contracts. But that money generally went to states along the border, such as Florida and Texas, which have high numbers of immigrants, as well as states such as Georgia and Louisiana, where large numbers of immigrants also are detained. ICE has begun providing more oversight as part of the Obama administration's pledge to overhaul the nation's system for jailing immigration offenders. It recently scrapped plans for CCA to build a 1,500-bed immigrant detention center in a high-end Miami suburb following months of local protests. But it remains committed to adding more private beds. Plans are on track to build or expand private immigration jails in Newark, New Jersey, in the suburbs of Chicago and along a lonely stretch of California's Mojave Desert.